Email notifications to store owners. By default email notifications ARE NOT sent to customers. If you're concerned about emails being sent to your customers, don't worry there is no changes you need to make. If you do want emails sent to customers on import, this can be configured from the data mapping. Go to the data mappings page and click edit (or New Data Mapping button if you're creating one from scratch) on the data mapping you want to use for your import. This will bring you to the Data Mapping page, from here click on the Email customer on import checkbox in the Customer Configuration section. Once you've activated the Email customer on import feature, click the Save or Update button on the bottom of the page. For a customer to get an email on import, you must map their email address. You can map the customers email address from the Order Details or Customer tab on the data mapping page. Click here for more information on associating a customer with your import. If the order is successfully imported. If there's an error with the order, the customer will not get an email notification. That's it. To summarize; a customer will get an email if you associate their email address with an order that is successfully import to Shopify using a data mapping that has the Email customer on import checkbox checked. When deleting an import, EZ Importer will never send email notifications to your user. However, if you have this feature turned on and you need to re-import your order you will need to make sure you go back to the data mapping and disable the Email customer on import feature before your next import. EZ Importer and Shopify do not keep track of emails that are sent to customers, so your customer will get multiple notifications in this case. Please make sure you disable the feature from your data mapping before you re-upload your file. 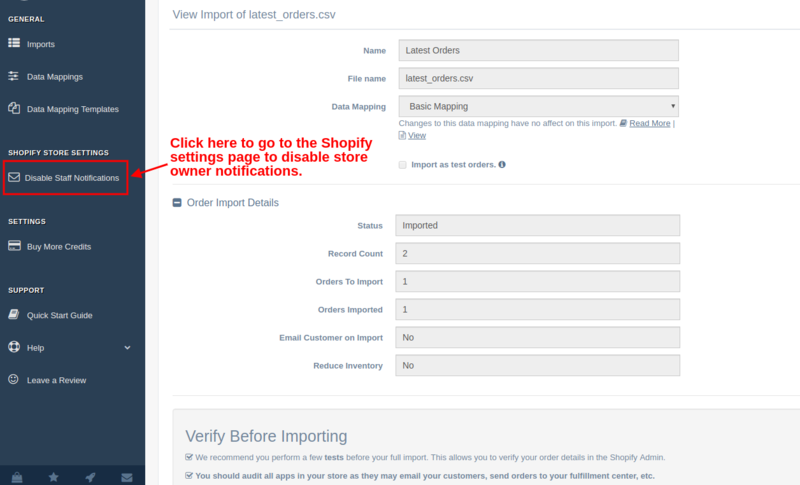 If an order is successfully imported Shopify will send the shop owner an email letting them know an order was imported. This means you will receive a notification from Shopify for every import in your import file. If you have a large import file this means you will get inundated with emails. At this time Shopify does not have a way for application developers to turn this off so you must do this manually. We've tried to make this as easy as possible for store owners. You'll see a link on the left hand navigation menu called Disable Staff Notifications. This will bring you to the Shopify "settings/notifications" page of your store admin. Once you are here go to the "Order Notifications" section. You will see a section that has an "Enable/Disable" button. You can click this button to turn your notifications on or off. Remember disabling this setting will turn notifications off for your entire store so you may want to put turn this on after the import. Remember these two notification settings are entirely different. The email notifications to customers are managed by EZ Importer and go directly to your customer, these settings are managed in the Data Mappings page of EZ Importer. The email notifications to store owner are notifications managed in your Shopify admin and are only sent to the email address associated with your store. If you have any other concerns or questions about either of these notifications please feel free to contact us.